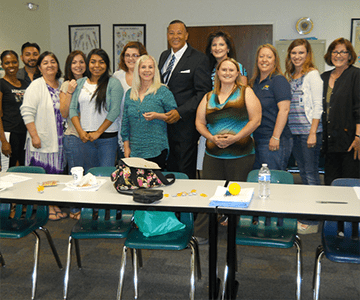 On Aug. 8, 15 Bakersfield Surgical Technology students, graduates and instructors hosted California State Assembly (CA-SA) Board members on campus for their quarterly meeting. CA-SA provided breakfast and SJVC’s Surg Tech program provided beverages and a meeting place for a half-day meeting that introduced Surgical Technology students to their organization. The meeting ended a little after noon and both the organization and Surgical Technology students feel that their objective was met. CA-SA was able to invite students to join their organization and Surgical Technology students got a closer look at the inner-workings of their industry representatives. CA-SA’s annual conference will be held on Oct. 27 at the Universal City Hilton, where an average of 100 attendees will have the opportunity to network and earn CEUs (continuing education units) during educational components of this event.